Comcast (s cmcsa) CEO Brian Roberts showed off the next-generation cable broadband technology on Thursday, which could deliver data at over 1 gigabit per second to our home. Roberts showed a live 11-mile cable network and downloaded 23 episodes of 30 Rock in 1 minutes and 39 seconds, touting it as the future of wireline broadband.The news of Comcast showing the demo came out yesterday. The cable industry is coming under increased pressure from fiber-based network providers who have the advantage of brand new networks with higher capacities. The latest version of DOCSIS on which Comcast demo was based shows that cable guys aren’t ready to throw in the towel just yet. It’s also facing pressure from faster wireless speeds from ISPs deploying LTE. Some customers may look at those speeds and decide to dump their wireline networks, which means cable has to offer both faster wireline networks, but also offer customers the convenience of faster wireless networks for customers outside the home. Hence, Roberts is extolling the virtues of Wi-Fi and calling it a game changer. “In 2020, we will want more bits in and out of our homes and we will build that, and we are confident that they will come,” Roberts added. I’m sure the cap will be raised when this comes out people. It would be a disservice to keep the cap at 250GB with this type of speed. Wow that is fast! I’ve definitely had some frustrating times with slow internet from Comcast… at times I think that it is a great company, but like many nationwide businesses it can have some weak spots. I was surfing the internet and I found this site where people can vent about poor customer service or products they received… it can get really funny. I would recommend you to check it out here. Bell has been laying fiber for a while and are starting to offer it on the last mile in select regions! I am in the Cable Industry and Cable Modems are my specialty, since 1999. I agree with many of you, it is simple to show the Max speeds with only a few modems, but wait until there are 200-400 modems on the same system.. Comcast has always been rated the worst of the CableTV companies, they are 3 years behind TimeWarner in Technology..They do not like to hire experienced people, because they want to be paid what they are worth..Then if they do bring people in they like to Fire people or release contracts every November.. So nobody wants to work for them.. I can demonstrate 1gbps connection inside my house on my e-net switch as well, doesn’t mean I will get that 1Gbps connection to Hulu or netflix or anything like that, until Comcast seriously upgrade their backbone and the entire internet upgrade the backbone system, having last mile 1Gbps service is no better than the current top tier 50mbps service available from the cable providers, it’s like having a Ferrari to pick up your mail, unless your mailman gets Ferrari’s as well, you still won’t get your mail any faster. The states will never catch up until “we” learn that a majority of the laws that are placed onto the books to protect us are merely laws to protect the existing larger corporations in the market. The examples are too many to list but just realize that most laws today are vetted by the larger companies before they are placed up for a vote. Pls! Do not complain! In Argentina we have less than 3MB broad band average! And the real connection is under 512! Enjoy Netflix and all the services you can! In other words who needs 1gb connection at home? I love the direction this is going. Some European countries are already demolishing North American internet speeds and it should not be seen as acceptable. If Comcast hammers this out, I hope it pushed to Canada soon after. Nothing like reaching your bandwidth caps at breakneck speeds! Not impressed. Why? Average U.S. house broadband speed is STILL TOO LOW PERIOD! And far too many U.S. houses don’t even HAVE broadband. So this is just a slap in the face of consumers. Not good, not good at all. Sonic.net is rolling out 1 Gb fiber to the door in Sebastapol, CA for $80/month. It’s a test market that will put pressure on Comcast to drop their crazy monopoly pricing. The just rolled out 100Mb service is available for $105/month but only if you are also paying for cable as well. What a joke. Comcast fails to mention that their cable lines are shared by many customers in the same neighborhood block. At 6pm, watch their network come to a slow dial up crawl because everyone is jumping on Netflix in the evening and clogging the pipe with Torrents and such. Good luck Comcast, you really need to start over and dig up the old lines and replace them with new modern technology if you plan to survive the long term. We have 1 Gbps internet in Sweden (since 2007) as well. For about 200$ a month. Complete joke! How many customers have 1gbs haredwired internet in their homes? Max wireless will do is about 500mbps. 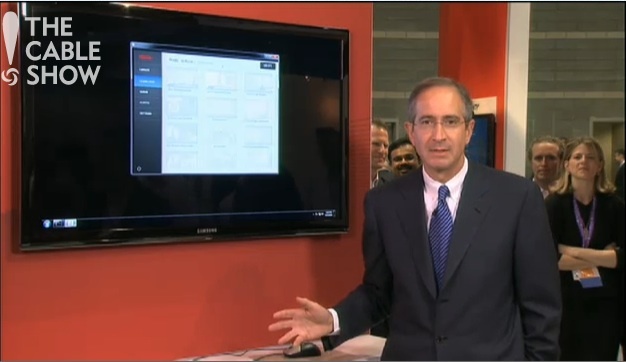 Comcast is feeling the heat from Fios. BTW you will share that bandwidth with other customers. I’ve had Comcast for internet service for about 10 years. They claim they match Fios in speed with their power boost technology. I have subscribed to their $60 service and it runs at best 16 mbs for download and 5 mbps upload. I just switched to Fios 25/25 for $62/month and it actually runs a sustained 25mbps both for upload and download. Don’t believe Comcast’s speed claims, they’re probably hyped and not what you’ll get in practice. Someone already mentioned the 250GB/month cap. All that speed will get you is reaching that cap faster and I’ll bet they come up with a new set of charges if you exceed it. Comcast is the evil empire! John, I agree with this statement. I moved from a FIOS area to a non FIOS area (comcast) and that power boost service is nothing but bullsh*t. You get that boost for about 30 seconds and you will watch your speeds trickle down to 2-3mbps. 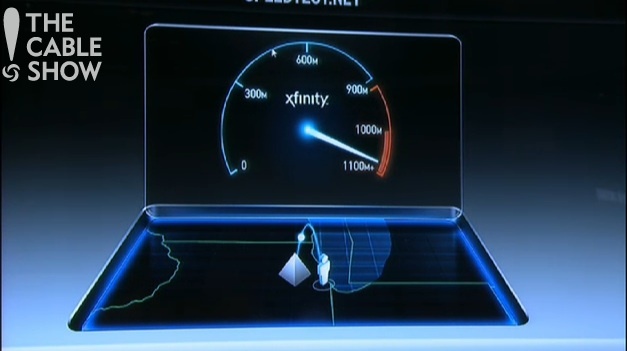 Using comcast was one of the main reasons I moved back to an area where FIOS is available. Now sustained speeds at 25/25mbps. I’ll never go back to shared cable and vaporware “power boost” technology. At 1Gbps, it would take 34 minutes to blow through Comcast’s 250GB download cap. I wonder what could be the problem here…. Impressive, but if you extrapolate from the pricing of their current broadband speeds – this would come in around $800/month. Hahhhhh Ha good one. Just because they can deliver that kind of speed doesnt mean anyone is actually ever going to see it in the real world. Besides your account would only be able to download content for 4 1/2 minutes before you exceed your cap anyway.